This Khomasdal based soccer team of Windhoek originally the Bethlehem Boys was established in 1983 throughout by a pupil lead initiative to facilitate meaningful activities during leisure time. It was soon discovered that the many street soccer players of this underprivileged neighborhood play an excellent touch and pass football and that, as authentic street and sand footballers, they were an enrichment to the official Namibian soccer. The boys quickly played through all the ranks, right into the first league and into the heart of the fans. They are still in the first league of Namibia and continue to play top class. The name of the team changed through the years from "The Bethlehem Boys" to the "Mighty Civilians" and now to the "Civics", which means : "The strong citizens" and "originals from our township". Like many other Namibian soccer teams, Civics suffered continues financial dire straights which hampered the effective running of their club. Every Friday the money needed for the games on Saturday was collected from donations. Some of the team kits were up to ten years old and soccer shoes were exchanged among the players. Sometimes the shoe size determined which players could be put on the field. However 250 young and old players were meaningfully occupied. When the neighbor club had almost disintegrated, the Buschschule Namibia took over in 2000. The management of the Buschschule accepted giving support and organizing this club as part of their social responsibility and community service. They totally rearranged the club and made it competitive. 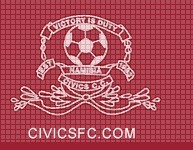 Today the Civics-team is a role model for the Namibian soccer and has quality players, organized women and youth teams. This team now plays in the Nambian club champions league. They have a vision to participate in the African champions league and to challenge teams like "Kaizer Chiefs" of Johannesburg. During their three European tours the Civics have won over many soccer enthusiasts. They were one of the first club teams from the southern Africa to introduce themselves in the northern hemisphere. They played against renowned teams like Galatasary Istanbul, The Saints /Southampten, Bocca Juniors and the under 21 national team of the Uruguay league. This African club earned the respect of the soccer world and stands for the creativity, discipline and future of Namibian soccer.